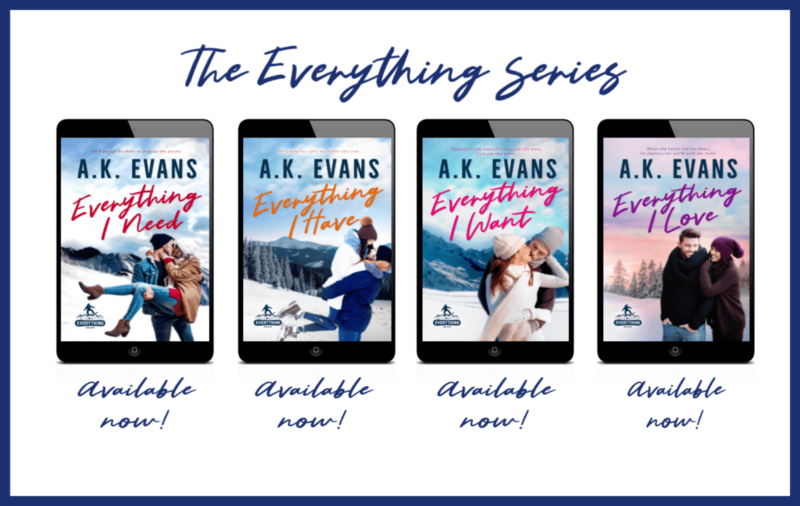 Today we have the re-release blitz of THE EVERYTHING SERIES by A.K. Evans! Check it out and be sure to grab your copy of this series now! Coming face-to-face with adversity more times than she cares to admit, she moves from the place she’s always called home. Determined to move past the events that shattered her world, Charley abandons her true calling in life and replaces it with exhausting days of mindless, unfulfilling work. Wes is a hometown hero. Snowboarder extraordinaire turned business owner, Wes’ focus is on making Blackman Boards the industry leader in snowboard production. Sadly, running a successful business has prevented him from keeping up with his passion for riding. But with his company set to launch a new series of boards, Wes finds himself back on the mountain. What he hadn’t expected to find was a mysterious girl with a battered heart. Charley is afraid to take a risk, knowing where it could lead. However, Wes is irresistibly charming. If she opens her heart to vulnerability, she’s worried tragedy may strike again. Wes wants the opportunity to prove that no matter what happens, he’ll always be there to pick up the pieces. Get Your Copy Today for .99! Ever since her abusive relationship ended in heartbreaking tragedy, she’s kept herself secluded to protect herself and those she loves. Unfortunately, Emme’s plans to remain unattached fall apart the moment Zane Cunningham sets his sights on her. 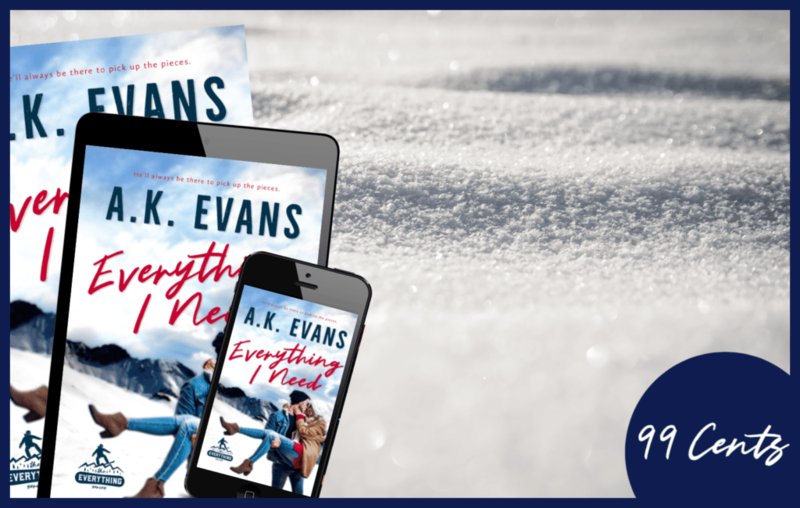 A professional snowboarder at the top of his game, Zane does not need a distraction. But when Emme walks into his life, he can’t fight the pull he feels toward her and will take her any way he can get her. Emme struggles to resist Zane’s persistent efforts to turn their friendship into something more. Having lived a charmed life, Zane is devastated when he learns the truth about the tragic incident in her past. 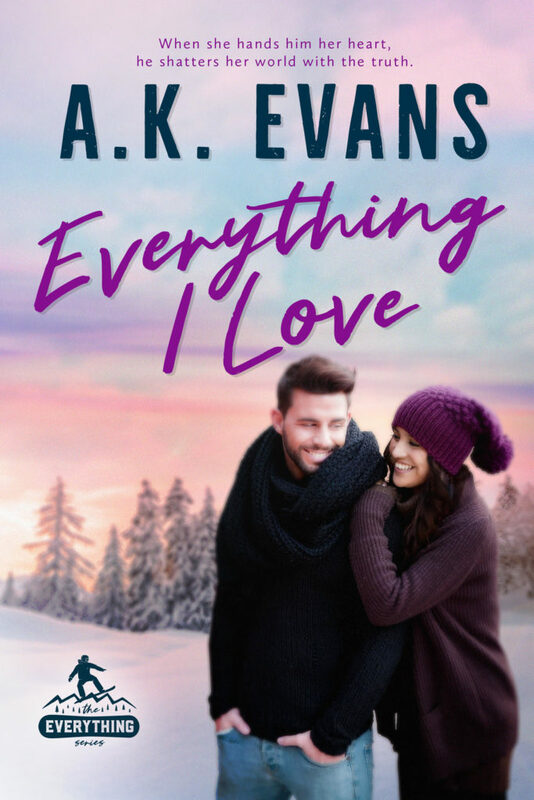 Realizing the ugliness in her life hasn’t deterred Zane, Emme finally gives into the attraction between them. 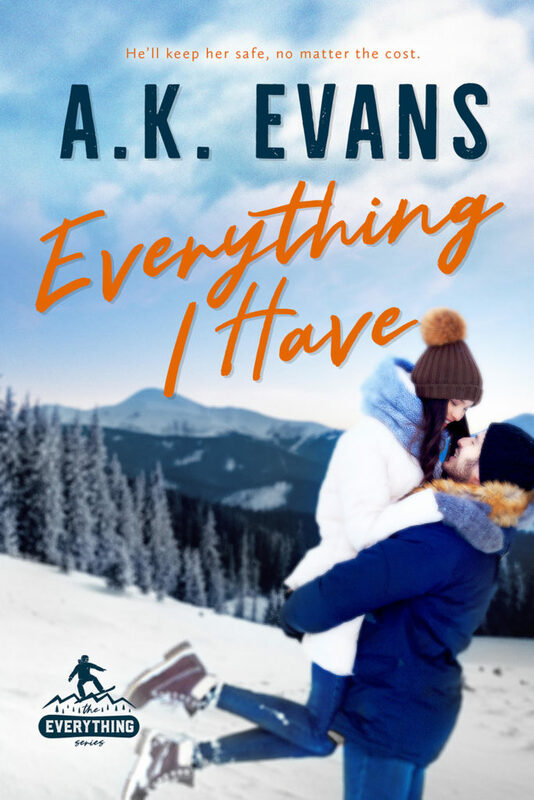 Just as Zane brings light and laughter into Emme’s life, her trouble finally catches up to her and threatens her newfound happiness. Zane promises he’ll keep her safe, no matter the cost. Because he knows that if he can’t, Emme may be lost in darkness forever. 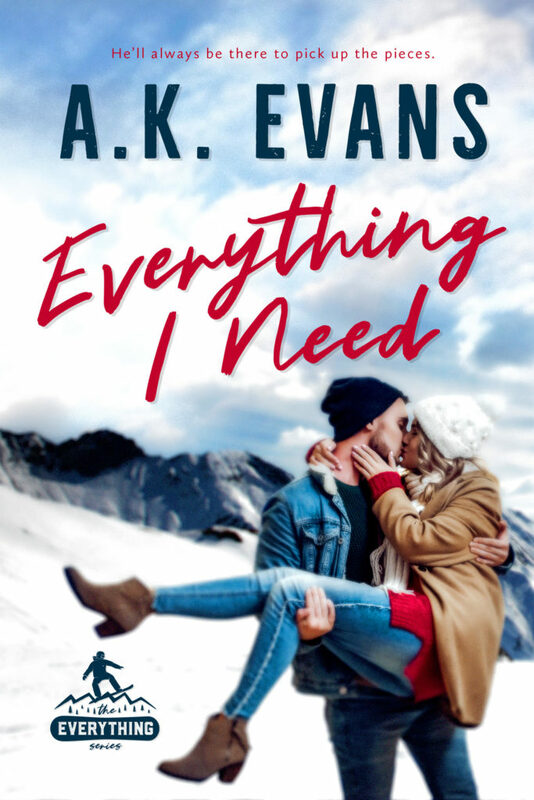 When starry-eyed dancer, Monroe Archer, meets professional snowboarder Xander Stone, she believes she’s found the man of her dreams. 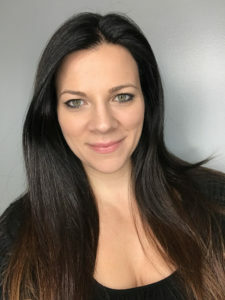 Searching for her fairytale romance since she was a little girl, Monroe uproots her life and goes after what she wants. Stone is a grief-stricken man. At a young age, he learned that forever doesn’t exist. Ever since, he’s been a tortured soul, living his life devoid of any new personal attachments. 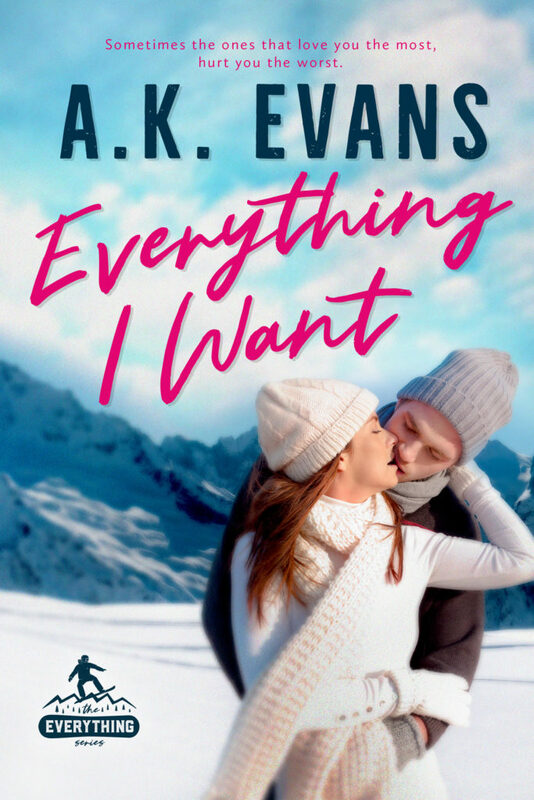 Not long after Monroe moves to town, she’s shocked to discover that despite their attraction, Stone is unwilling to offer anything more than just friendship. Just as Monroe tries to move on, Stone realizes his attraction to her isn’t something he can so easily deny. Powerless to resist her any longer, Stone starts something with Monroe knowing he is incapable of giving her forever. With her sweet and charming disposition, Monroe sets out to heal the wounds left on the heart of the man she loves. But it isn’t long before Monroe realizes that sometimes those that love you most are the ones that hurt you the worst. Nikki Drake was just nine years old when she experienced her first heartbreak. Sixteen years and many betrayals later, she’s learned that life is what you make of it. While her past hasn’t stopped her from working hard and becoming a genuine and confident woman, it has affected one small part of her. Nikki refuses to give her heart to anyone ever again. Luke Townsend is a man most women dream about. Underneath his tall, handsome exterior he’s charming, compassionate, sensitive, and loyal. A dedicated snowboarder, Luke knows what it means to work hard for what he wants. And what Luke wants is Nikki. When Luke tells Nikki he’s fallen in love with her, she’s devastated to think she’s going to hurt him the same way others have hurt her. Having resolved to live a life without romantic love, Nikki rejects him. Luke walks away, vowing to find a way to win her heart. Three months later, Nikki decides to take a chance on Luke. He is patient and understanding while she struggles to be vulnerable and to find the courage to trust he won’t hurt her. But when Nikki finally hands her heart over to him, Luke shatters her world with the truth. I love the covers and synopses! This sounds like an awesome series. I can’t wait to start reading.